We are about 50 days away from the annual Arctic ice extent minimum, which typically occurs on or about day 260 (mid September). Some take any year’s slightly lower minimum as proof that Arctic ice is dying, but the image below shows day 260 over the last 10 years. The Arctic heart is beating clear and strong. Over this decade, the Arctic ice minimum has not declined, but looks like fluctuations around a plateau since 2007. By mid-September, all the peripheral seas have turned to water, and the residual ice shows up in a few places. The table below indicates where we can expect to find ice this next September. BCE (Beaufort, Chukchi and East Siberian) on the Asian side are quite variable as the largest source of ice other than the Central Arctic itself. Greenland Sea and CAA (Canadian Arctic Archipelago) together hold almost 0.5M km2 of ice at minimum, fairly consistently. LKB are the European seas of Laptev, Kara and Barents, a smaller source of ice, but a difference maker some years, as Laptev was in 2016. Baffin and Hudson Bays are almost inconsequential. For context, note that the average maximum has been 15M, so on average the extent shrinks to 30% of the March high before growing back the following winter. To arrive at a wise policy response, we first need to consider how much economic damage climate change will do. Current models struggle to come up with economic costs consummate with apocalyptic political rhetoric. Typical costs are well below 10% of gross domestic product in the year 2100 and beyond. That’s a lot of money—but it’s a lot of years, too. Even 10% less GDP in 100 years corresponds to 0.1 percentage point less annual GDP growth. Climate change therefore does not justify policies that cost more than 0.1 percentage point of growth. If the goal is 10% more GDP in 100 years, pro-growth tax, regulatory and entitlement reforms would be far more effective. 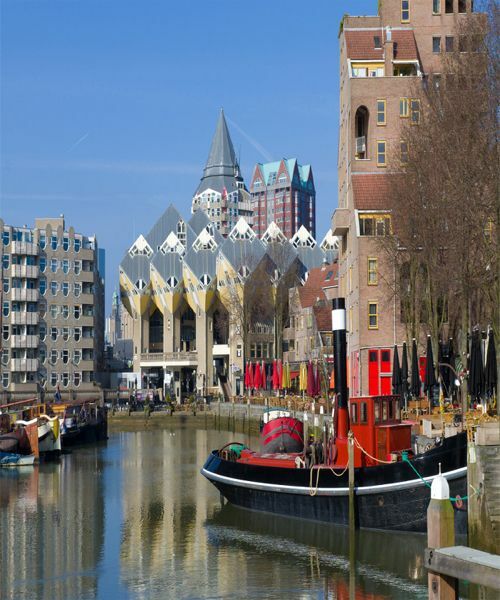 Rotterdam–Ninety years thriving behind dikes and dams. But spread over a century, the costs of moving and adapting are not as imposing as they seem. Rotterdam’s dikes are expensive, but not prohibitively so. Most buildings are rebuilt about every 50 years. If we simply stopped building in flood-prone areas and started building on higher ground, even the costs of moving cities would be bearable. Migration is costly. But much of the world’s population moved from farms to cities in the 20th century. Allowing people to move to better climates in the 21st will be equally possible. Such investments in climate adaptation are small compared with the investments we will regularly make in houses, businesses, infrastructure and education. Facing this reality, some advocate that we buy some “insurance.” Sure, they argue, the projected economic cost seems small, but it could turn out to be a lot worse. But the same argument applies to any possible risk. If you buy overpriced insurance against every potential danger, you soon run out of money. You can sensibly insure only when the premium is in line with the risk—which brings us back where we started, to the need for quantifying probabilities, costs, benefits and alternatives. And uncertainty goes both ways. Nobody forecast fracking, or that it would make the U.S. the world’s carbon-reduction leader. Strategic waiting is a rational response to a slow-moving uncertain peril with fast-changing technology. Global warming is not even the obvious top environmental threat. Dirty water, dirty air and insect-borne diseases are a far greater problem today for most people world-wide. Habitat loss and human predation are a far greater problem for most animals. Elephants won’t make it to see a warmer climate. Ask them how they would prefer to spend $1 trillion—subsidizing high-speed trains or a human-free park the size of Montana. Then, we need to know what effect proposed policies have and at what cost. Scientific, quantifiable or even vaguely plausible cause-and-effect thinking are missing from much advocacy for policies to reduce carbon emissions. The Intergovernmental Panel on Climate Change’s “scientific” recommendations, for example, include “reduced gender inequality & marginalization in other forms,” “provisioning of adequate housing,” “cash transfers” and “awareness raising & integrating into education.” Even if some of these are worthy goals, they are not scientifically valid, cost-benefit-tested policies to cool the planet. Climate policy advocates’ apocalyptic vision demands serious analysis, and mushy thinking undermines their case. If carbon emissions pose the greatest threat to humanity, it follows that the costs of nuclear power—waste disposal and the occasional meltdown—might be bearable. It follows that the costs of genetically modified foods and modern pesticides, which can feed us with less land and lower carbon emissions, might be bearable. It follows that if the future of civilization is really at stake, adaptation or geo-engineering should not be unmentionable. 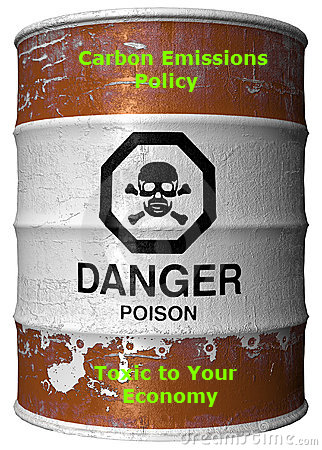 And it follows that symbolic, ineffective, political grab-bag policies should be intolerable. 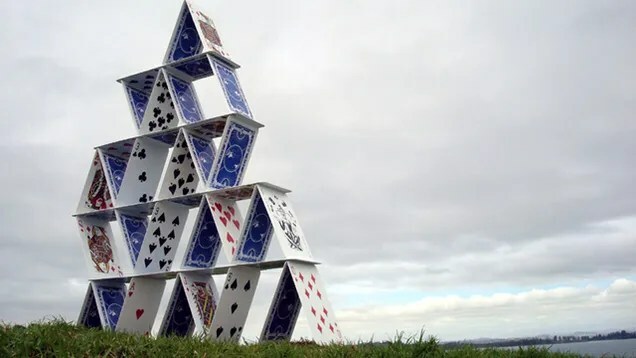 Climate science, impacts and policies also appear as a house of cards. Mr. Henderson is a research fellow with the Hoover Institution and an economics professor at the Naval Postgraduate School. Mr. Cochrane is a senior fellow of the Hoover Institution and an adjunct scholar of the Cato Institute. Policy makers and the public need to understand the extent to which major scientific institutions like the American Meteorological Society have become biased and politicized on the climate issue. Convincing them of this becomes much easier when the organizations themselves supply the evidence. Perry’s response prompted a letter of protest from Keith Seitter, executive director of the American Meteorological Society. The letter admonished him for supposedly contradicting “indisputable findings” that emissions of CO2 and other greenhouse gases are the primary cause of recent global warming, a topic for which Seitter insists there is no room for debate. But the meteorological society leapt to condemn Perry for a cautious response to an awkward question. Perry could not reasonably have agreed with the interviewer since the concept of a “control knob” for the Earth’s temperature wasn’t defined. Doubling CO2 might, according to models, cause a few degrees of warming. Doubling the size of the sun would burn up the planet. Doubling cloud cover might trigger an ice age. So which is the “primary control knob”? The meteorological society letter ignored the odd wording of the question, misrepresented Perry’s response and then summarily declared their position on climate “indisputable.” Perry’s cautious answer, by contrast, was perfectly reasonable in the context of a confusing question in a fast-moving TV interview. Furthermore, Seitter’s letter invites skepticism. It pronounces confidently on causes of global warming “in recent decades” even though this is where the literature is most disputed and uncertain. Climate models have overestimated warming in recent decades for reasons that are not yet known. Key mechanisms of natural variability are not well understood, and measured climate sensitivity to CO2 appears to be lower than modelers assumed. Climate models tweaked to get recent Arctic sea ice changes right get overall warming even more wrong, adding to the list of puzzles. But to the meteorological society, the fact that these and many other questions are unresolved does not prevent them from insisting on uniformity of opinion. The meteorological society letter is all about enforcing orthodoxy, which speaks ill of the leadership’s overall views on open scientific debate. Ross McKitrick is a professor of economics at the University of Guelph and an Adjunct Scholar at the Cato Institute. Footnote: Arnd’s comment below reminds of this image. 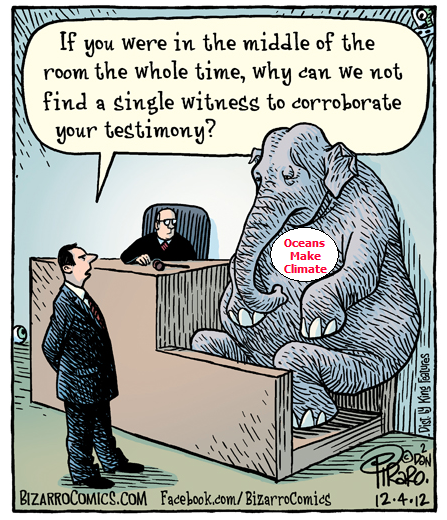 It works even better with Republican Rick Perry testifying to the ocean’s climate dominance. In July, the Northern Sea Route (NSR) starts to open for commercial shipping. As previously reported here Arctic Ice Takes Revenge, a convoy of Russian cargo ships including icebreakers were trapped by January ice and were stranded in Pevek. May 30 they were able to leave port, but making it home to Arkhangelsk is still uncertain since plenty of ice remains in Eastern Siberian and Laptev seas. More about the NSR shipping situation at the end of this post. The image below shows the evolution of ice extents since 2007 along the Northern Sea Route. The principal challenge for shipping is Laptev sea, and secondarily East Siberian and Kara seas. The graph below shows Arctic ice extents comparing 2017 to the eleven-year average, to 2016 and 2007, as well as SII estimates. This year ice extents are ~200k km2 higher than average at day 208, 660k km2 greater than 2016, and 760k km2 surplus above 2007. MASIE, with its higher resolution mapping shows 600k km2 more ice than Sea Ice Index (SII). 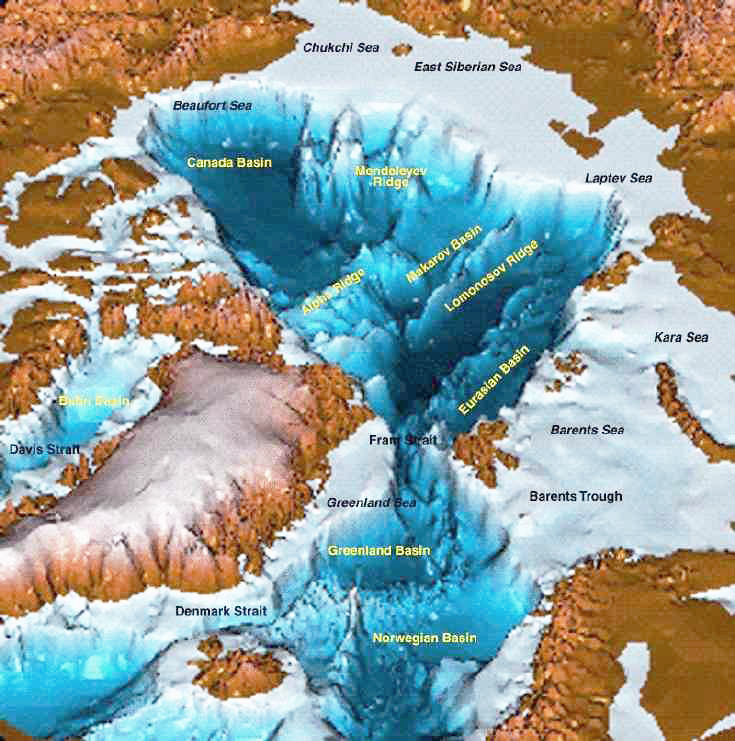 The table below presents the ice extents in various regions of the Arctic Ocean. The only sizeable 2017 deficits to decadal average are in Chukchi and East Siberian seas. Ice surpluses this year offset the losses, especially in Laptev, Greenland Sea, Baffin Bay and the Central Arctic. Barents has been holding steady at the highest minimum of the decade, set by 2014. 2007 is eclipsed by 2017 in almost every region. According to the data provided by the Northern Sea Route Information Office, traffic volume in 2016 has increased by 35% in comparison with 2015. However the traffic remained low with only 19 vessels using the route, far from the record set in 2013 with 71 vessels. Steep downturn started in 2014, the amount of cargo transported in transit dropping 77 per cent compared to the previous year. The navigation season for transit passages on NSR starts approximately at the beginning of July and lasts through to the second half of November. There are no specific dates for commencement and completion of navigation; it all depends on particular ice conditions. In 2011 the navigation season on the NSR seaways for large vessels constituted 141 days in total, i.e. more than 4.5 months. In recent years quite easy ice conditions have been observed and that offers more considerable opportunities for operation at the NSR seaways. 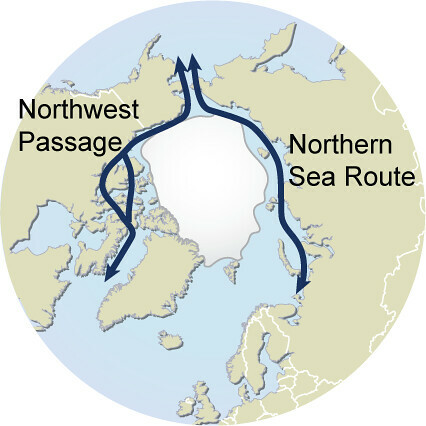 All NSR seaways are currently located in the area of one-year ice. 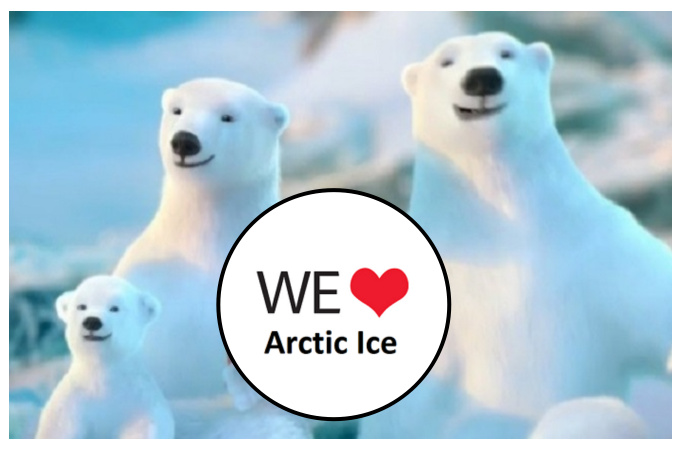 In the arctic conditions one-year ice grows approximately up to 1.6 metres. Arktika-type icebreaker can open passages through up to 2.3m thick ice. In early July, at the beginning of navigation ice is not pressurized. The ice is broken and easily moved through. . . Therefore, in the current ice conditions vessels can navigate from July until December. The NSR will not become a major shipping route. Not today and not in 2030 – or even 2050. As long as there is winter ice, which makes the Arctic Ocean unnavigable for part of the year, it will not be suitable for regular transit traffic. There may be occasional voyages, as we have seen over the past few years, delivering timber from Finland to Canada, or Norwegian fish and LNG to Japan or iron ore to China. But the NSR will not see containerized cargo on which global trade operates. There are a host of reasons for that, the biggest ones being lack of schedule reliability and seasonability of the route, lack of ports of call and increased insurance premiums on the NSR over Suez. As a comparison: the Suez Canal sees around 18,000 transits per year, the Panama Canal around 15,000, the Straits of Malacca around 65,000. In the past five years taken together, the NSR saw around 200 transits, with most vessels being tiny compared to the giant container ships and bulk carriers passing through the world’s shipping hubs. The 259 meters long, 34 meter wide «Shturman Albanov» in early May arrived in Murmansk with another load of oil from Novy Port, the new oil field in the Yamal Peninsula. It marked the 5th million ton of oil delivered from the field, operator Gazprom Neft informs. In the course of the last 12 months, a total of 196 shiploads of oil have made from Yamal to Murmansk. Shipping company Sovcomflot now has three brand new Arc7 ice class tankers dedicated to shipments from the new Arctic field. In previous posts and comments I had said that adjustments had added only about 0.2°C of spurious warming to the global SAT record over the last 100 years or so – not enough to make much difference. But after further review it now appears that they may have added as much as 0.4°C. The current GISS series shows about 0.3°C more global warming than the old version, with about 0.2°C more warming in the Northern Hemisphere and about 0.5°C more in the Southern. The added warming trends are almost exactly linear except for the downturns after 2000, which I suspect (although can’t confirm) are a result of attempts to track the global warming “pause”. 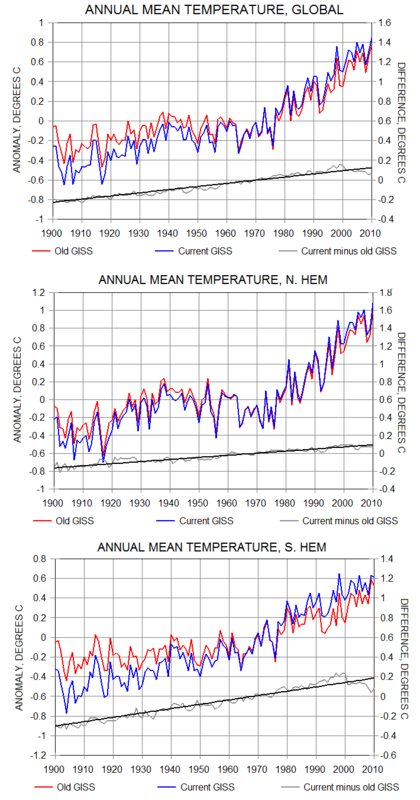 How did GISS generate all this extra straight-line warming? It did it by replacing the old unadjusted records with “homogeneity-adjusted” versions. The adjusted “current” GISS series match the global and Northern Hemisphere model trend line gradients almost exactly but overstate warming relative to the models in the Southern (although this has only a minor impact on the global mean because the Southern Hemisphere has a lot less land and therefore contributes less to the global mean than does the Northern). But the unadjusted “old” GISS series, which I independently verified with my own from-scratch reconstructions, consistently show much less warming than the models, confirming that the generally good model/observation match is entirely a result of the homogeneity adjustments applied to the raw SAT records. 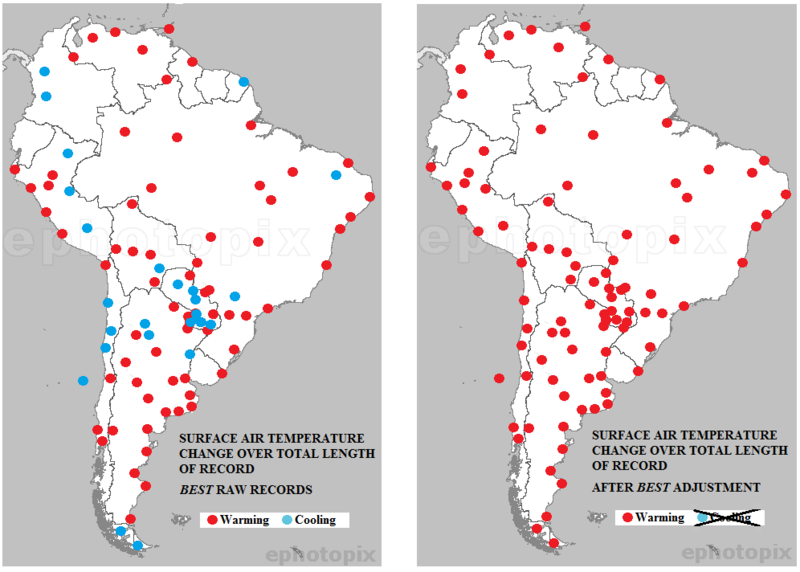 In this post I have chosen to combine a large number of individual examples of “data being adjusted to match it to the theory” into one single example that blankets all of the surface air temperature records. The results indicate that warming-biased homogeneity adjustments have resulted in current published series overestimating the amount by which surface air temperatures over land have warmed since 1900 by about 0.4°C (Table 1), and that global surface air temperatures have increased by only about 0.7°C over this period, not by the ~1.1°C shown by the published SAT series. Land, however, makes up only about 30% of the Earth’s surface. The subject of the next post will be sea surface temperatures in the oceans, which cover the remaining 70%. In it I will document more examples of measurement manipulation malfeasance, but with a twist. Stay tuned. Horner understands the magnitude of Trump’s achievement so far. Even Trump announcing his plan to pull out of the UN Paris climate agreement required immense determination and moral courage. After all his decision wasn’t only resisted by the usual Democrat suspects and green lobbyists: it also came up against stiff opposition from key members of the Administration, among them, Secretary of State Rex Tillerson and Economics Advisor Gary Cohn. 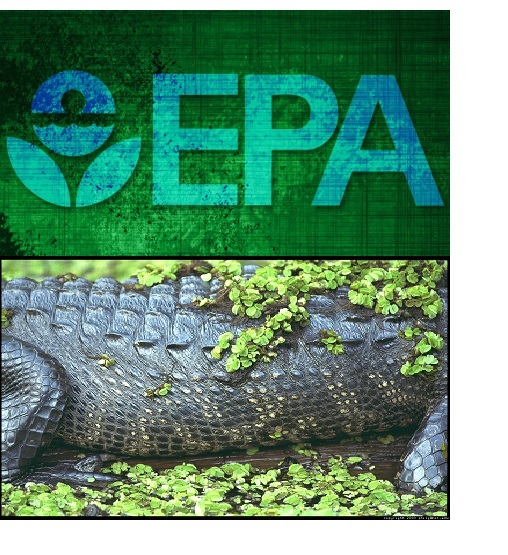 In fact, argues Horner, probably nowhere in DC is the swamp more heavily defended by the liberal politico-media establishment than the EPA and the climate change industry. “He was not saying this as a politician says it. (‘And if we use spoons not shovels we can create even more jobs…’ That sort of playground thinking is very common among politicians.) And whatever anybody thinks about Donald Trump you can be confident of this. At 21, at Le Cirque, somewhere at some point, somebody who is making a killing off the rents of the global warming industry laughed it up a little too loudly or once too many times around Donald Trump. Because what he said to the Washington Post was “You’re robbing Peter to pay Paul. Goldmans is making a killing out of this.” That’s what I heard him say. Politicians normally fall for this. But not Donald. A politician would have been sidetracked by all the talk of “green jobs” or “saving the planet.” But Trump made his decision using much the same gut feeling he uses on his business deals. “Something about this climate change business stinks,” he probably said to himself at some stage. And if so, he would have been quite right, it does. To follow the money see also Climate Crisis Inc. When President Trump pulled out of the Paris climate accords, embraced coal, and stacked his administration from people from fossil-fuel producing states, the environmental movement reacted with near-apocalyptic fear and fury. They would have been better off beginning to understand precisely why the country has become so indifferent to their cause, as evidenced by the victory not only of Trump but of unsympathetic Republicans at every level of government. Yet there’s been little soul-searching among green activists and donors, or in the generally pliant media since November about how decades of exaggerated concerns—about peak oil, the “population bomb,” and even, a few decades back, global cooling—and demands for economic, social, and political sacrifices from the masses have damaged their movement. Not long ago, many greens still embraced pragmatic solutions—for example substituting abundant natural gas for coal—that have generated large reductions in greenhouse gas emissions. Rather than celebrate those demonstrable successes, many environmentalists began pushing for a total ban on the development of fossil fuels, including natural gas, irrespective of the costs or the impact on ordinary people. James Lovelock, who coined the term “Gaia,” notes that the green movement has morphed into “a religion” sometimes marginally tethered to reality. 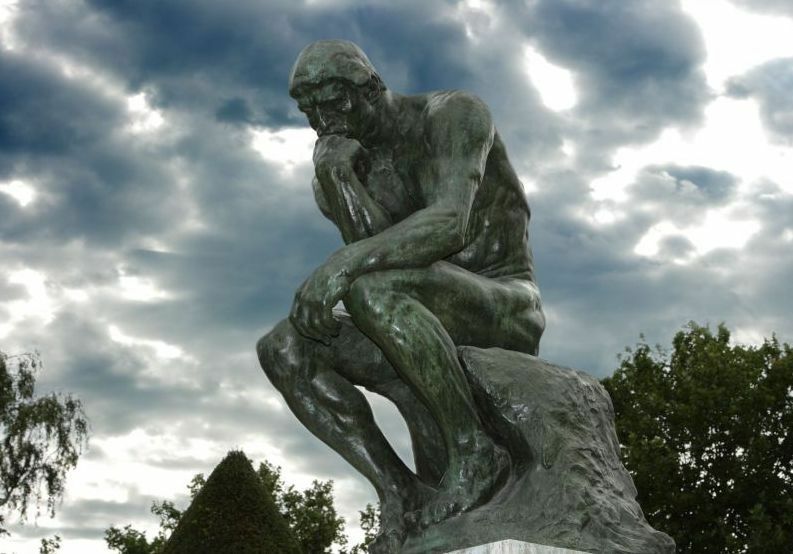 Rather than engage in vigorous debate, they insist that the “science is settled” meaning not only what the challenges are but also the only acceptable solutions to them. There’s about as much openness about goals and methods within the green lobby today as there was questioning the existence of God in Medieval Europe. With the Judeo-Christian and Asian belief systems in decline, particularly among the young, environmentalism offers “science” as the basis of a new theology. The believers at times seem more concerned in demonstrating their faith than in passing laws, winning elections or demonstrating results. So with Republicans controlling the federal government, greens are cheering Democratic state attorney generals’ long-shot legal cases against oil companies. The New York Times’ Thomas Friedman has talked about dismissing the disorder of democracy as not suited to meeting the environmental challenges we face, and replacing it with rulers like the “reasonably enlightened group of people” who run the Chinese dictatorship. After Trump pulled the U.S. out of the Paris climate accord, China was praised, bizarrely, as the great green hope. The Middle Kingdom, though, is the world’s biggest and fastest growing emitter, generating coal energy at record levels. It won’t, under Paris, need to cut its emissions till 2030. Largely ignored is the fact that America, due largely to natural gas replacing coal, has been leading the world in GHG reductions. Among many greens, and their supports, performance seems to mean less than proper genuflecting; the Paris accords, so beloved by the green establishment, will make little impact on the actual climate, as both rational skeptics like Bjorn Lomborg and true believers like NASA’s James Hanson agree. In this context, support for Paris represents the ultimate in “virtue signaling.” Ave Maria, Gaia. The UN climate train wreck. Coercion has its consequences. California has imposed, largely in the name of climate change, severe land use controls that have helped make the state among the most unaffordable in the nation, driving homeownership rates to the lowest levels since the 1940s, and leaving the Golden State with the nation’s highest poverty rate. The biggest losers from Brown’s policies have been traditional blue collar, energy-intensive industries such as home building, manufacturing, and energy. Brown’s climate policies have boosted energy prices and made gas in oil-rich California about the most expensive in the nation. That doesn’t mean much to the affluent Tesla-driving living in the state’s more temperate coast, but it’s forced many poor and middle-class people in the state’s less temperate interior into “energy poverty,” according to one recent study. that, too, fits the climatista’s agenda, which revolves around social engineering designed to shift people from predominately suburban environments to dense, urban and transit dependent ones. The state’s crowded freeway are not be expanded due to a mandated “road diet,” while local officials repeatedly seek to reduce lanes and “calm traffic” on what are already agonizing congested streets. In this shift, market forces and consumer preferences are rarely considered, one reason these policies have stimulated much local opposition—and not only from the state’s few remaining conservatives. California’s greens ambitions even extend to eating habits. Brown has already assaulted the beef producers for their cattle’s flatulence. Regulators in the Bay Area and local environmental activists are proposing people shift to meatless meals. Green lobbyists have already convinced some Oakland school districts to take meat off the menu. OK with me, if I get the hamburger or taco-truck franchise next to school when the kids get out. Sadly, many of these often socially harmful policies may do very little to address the problem associated with climate change. California’s draconian policies fail to actually do anything for the actual climate, given the state’s already low carbon footprint and the impact of people and firms moving to places where generally they expand their carbon footprint. Much of this has taken on the character of a passion play that shows how California is leading us to the green millennium. An even bigger ambition of the green movement—reflecting concerns from its earliest days—has been to reduce the number of children, particularly in developed countries. Grist’s Lisa Hymas has suggested that it’s better to have babies in Bangladesh than America because they don’t end up creating as many emissions as their more fortunate counterparts. Hymas’ ideal is to have people become GINKs—green inclinations, no kids. Many green activists argue that birth rates need to be driven down so warming will not “fry” the planet. Genial Bill Nye, science guy, has raised the idea of enforced limits on producing children in high-income countries. This seems odd since the U.S. already is experiencing record-low fertility rates, a phenomenon in almost all advanced economies, with some falling to as little as half the “replacement rate” needed to maintain the current population. In these countries, aging populations and shrinking workforces may mean government defaults over the coming decades. The demographic shift, hailed and promoted by greens, is also creating a kind of post-familial politics. Like Jerry Brown himself, many European leaders—in France, Germany, Sweden, the United Kingdom, and the Netherlands—are themselves childless. Their attitude, enshrined in a EU document as “no kids, no problem” represents a breathtaking shift in human affairs; it’s one thing to talk a good game about protecting the “next generation” in the collective abstract, another to experience being personally responsible for the future of another, initially helpless, human being. The pressing need to change people’s lives seems intrinsic now to green theology. Without penance and penalties, after all, there is no redemption from original sin. In the process, it seems to matter little if we undermine the great achievements of our bourgeois economy—expanded homeownership, greater personal mobility, the ability to rise to a higher class—if it signals our commitment to achieve a more earth-friendly existence. The left-wing theorist Jedidiah Purdy has noted that “mainstream environmentalism overemphasizes elite advocacy” at the expense of issues of economic equity, a weakness that both Trump and the GOP have exploited successfully, particularly in the Midwest, the South, and Intermountain West. Some greens object even to the idea of GDP growth at a time when most Americans are seeing their standard of living drop. No surprise then that the green agenda has yet to emerge from the basement of public priorities, which remain focused on such mundanities as better jobs, public safety, and decent housing. To further alienate voters, many green scolds live far more lavishly than the people they are urging to cut back. Greens have won over a good portion of the corporate elite, many of whom see profit in the transformation as they reap subsidies for “green” energy, expensive and often ineffective transit and exorbitant high-density housing. Most notable are the tech oligarchs, clustered in ultra-green Seattle and the Bay Area, who depend on massive amounts of electricity to run their devices, but have reaped huge subsidies for green energy. The tech oligarchs have little interest in family friendly suburbs, preferring the model of prolonged adolescence in largely childless places like college campuses and San Francisco. Oligarchs such as Mark Zuckerberg live in spacious and numerous houses, even while pressing policies that would push everyone without such a fortune to downsize. Richard Branson, another prominent green supporter, may not like working people’s SUVs, but he’s more than willing to sponsor climate change events on a remote Caribbean island reachable only by private plane. One does not even need to plumb the hypocrisy of Al Gore’s jet-setting luxurious lifestyle. 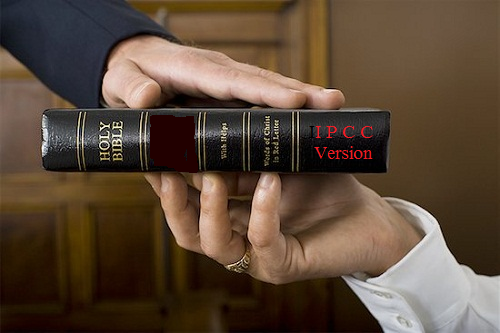 In the manner of Medieval indulgences these mega emissions-generators claim to pay for their carbon sins by activism, buying rain forests and other noble gestures. Hollywood, as usual, is particularly absurd, with people like Leonardo di Caprio flying in his private jet across country on a weekly basis. Living in Malibu, Avatar director James Cameron sees skeptics as “boneheads” who will have “to be answerable” for their dissidence, suggesting perhaps a shootout at high noon. In the end, the greens and their wealthy bankrollers may find it difficult to prevail as long as their agenda makes people poorer, more subservient, and more miserable; this disconnect is, in part, why the awful Donald Trump is now in the White House. Making progress on climate change, and other environmental concerns, remains a critical priority, but it needs to explore ways humans, through ingenuity and innovation, can meet these challenges without undermining what’s left of our middle class and faded democratic virtue. Updating Ontario’s energy debacle shows that Toronto and Ottawa have now achieved the highest electricity rates in Canada. And a new wheel falling off the bus has crushed 340 jobs. 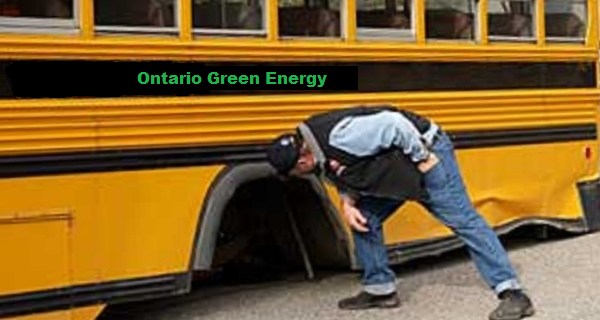 Kelly McFarland reports the news in Another wheel flies off Ontario’s green energy bus, and lands on 340 workers. The plant made windmill blades. 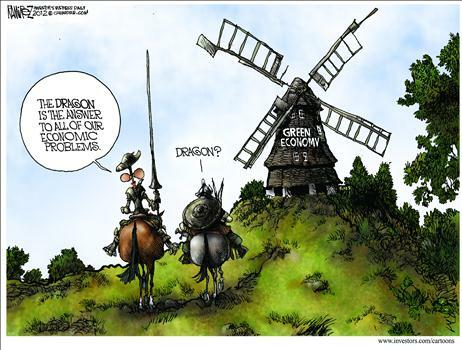 Windmills were the future. Clean energy was what McGuinty’s two-year-old Green Energy Act was all about. It would free the province of old, dirty manufacturing and introduce new, cutting-edge jobs that would make Ontario the envy of the world. Just six years later the plant is closing. Management says big changes in the wind industry make it no longer viable. The cutting edge plant that was to help lead Ontario into the Valhalla of a clean energy future can’t survive in a market that wants bigger blades. Ontario’s electricity price increases were more than double the national average. To get a sense of how much more Ontarians pay compared to the rest of the country, consider a comparison of monthly electricity bills between Toronto and Montreal, Canada’s two largest cities. In 2016, the estimated average monthly electricity bill (including taxes) for Torontonians was $201, or roughly $2,400 for the year. Residents of Montreal only paid an estimated $83 per month, or just under $1,000 per year. That’s an extra $1,400 a year that Montrealers can spend on other priorities because of lower electricity prices. A large part of the blame rests on poor policy choices at Queen’s Park. One such policy has been the government’s poorly structured long-term contracts for renewable energy generation, like wind and solar. These contracts place ever-increasing costs on consumers, despite the fact that renewables accounted for only 6.8 per cent of electricity generation in 2016. The province’s phase-out of coal-fired electricity has also proved costly and unnecessary. Indeed, noted environmental economist Ross McKitrick found that Ontario could have achieved the same environmental benefits of the phase-out (at one-tenth the cost) by simply completing the retrofitting of Ontario’s coal-fired plants. 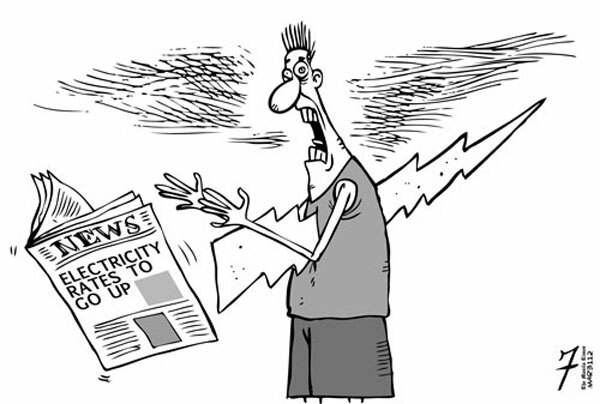 Another issue is the imbalance between the supply and demand of electricity in the province. When the province’s energy generation exceeds demand, it must be exported — quite often at a loss — leaving Ontario ratepayers to cover the difference. Does anyone remember the last time anything positive emerged from Ontario’s electricity industry, battered and bruised from 13 years of Liberal government manhandling? Hydro rates so punitive the Liberals have applied layer on layer of subsidies, borrowing the money or pushing debt onto future generations to do so. An estimated $45 billion extra in future costs so the government can reduce consumer bills now, as it campaigns for re-election. Billions lost selling power at a loss to the U.S., which will now be made easier by approval of a power line under Lake Erie. Liberal energy strategy was always predicated on the belief that politicians could dictate to the market and control the outcome. Despite overwhelming evidence that governments do badly when they try to remove the freedom from free enterprise, Wynne and McGuinty ploughed ahead in their determination to impose their vision on Canada’s biggest province and most important economy. The result has been a catalogue of disasters. The $2 billion smart meter program that proved a bust at reducing demand; the gas plant construction projects halted in mid-campaign to protect a few Liberal seats; the doubling of consumer electricity bills; the army of windmills marching across vast expanses of rural Ontario, defacing the landscape while producing pricey, unneeded power. Climate Activists storm the bastion of Exxon Mobil, here seen without their shareholder disguises. It’s not only big oil companies under siege from anti-fossil fuel activists. All businesses, small and large, private and publically traded are in the crosshairs. Robert Bradley has a recent post directed at leaders of businesses, both large and small with respect to global warming/climate change. The article is Climate Alarmism and Corporate Responsibility at Master Resource. 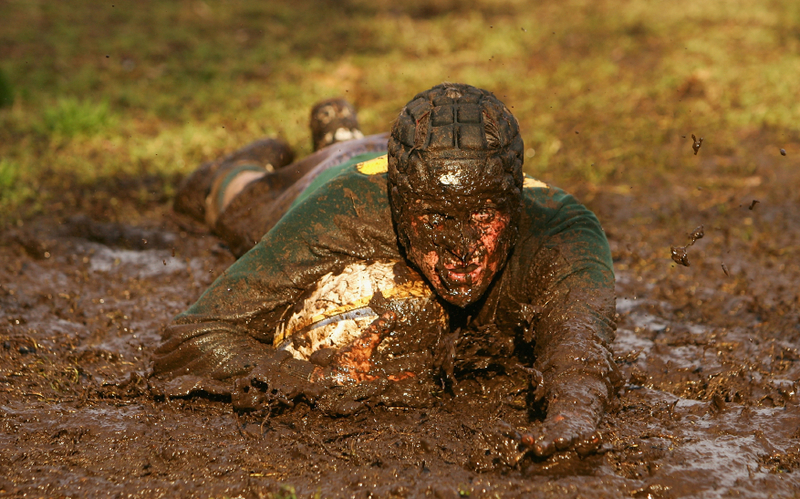 It is important advice since the large majority of business people are ethical and want to do the right thing, but their good intentions can be used against them in the current feverish media and political environment. 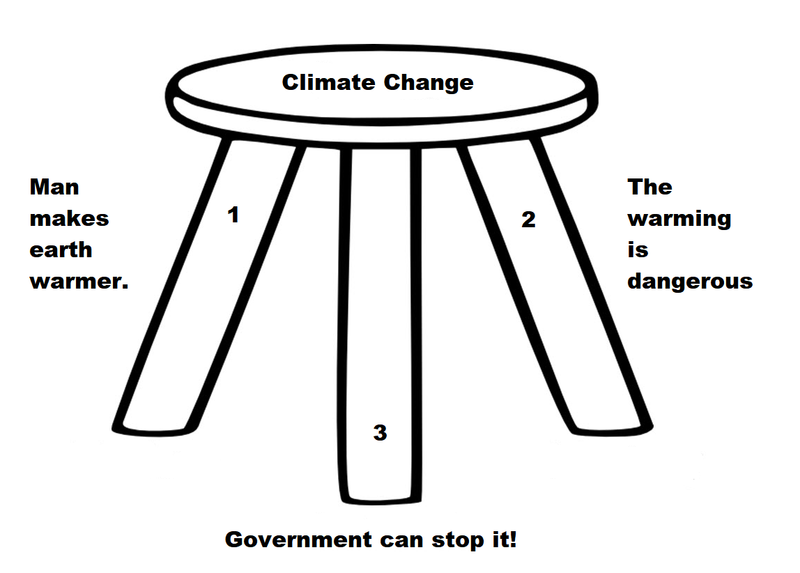 Climate Science: Where’s the Alarm? Increasing atmospheric concentrations of carbon dioxide (CO2), the preeminent anthropogenic greenhouse gas, benefit plant life and agricultural productivity and are not a direct human health issue. It will be centuries before the plant optimum concentration is reached and exceeded, creating a long potential glide path for hydrocarbon energies to “green” planet earth. The surface warming (“greenhouse signal”) of recent decades shows a relatively benign distribution. Minimum (night, winter) temperatures have been increasing twice as much as maximum (daytime, summer) temperatures. Higher nighttime temperatures and longer growing seasons reinforce the aforementioned carbon fertilization effect to aid plant growth and agricultural productivity. Model-estimated warming from anthropogenic effects has fallen over time. . .The chart above shows IPCC (2007) projecting warming at 0.38C per decade and the last report (2013) dropped to 0.17 C per decade. With a more than 50 percent drop in the IPCC estimate in six years, there is clear evidence that model revision and more realistic forcing scenarios have weakened the alarmist scenario. Today’s lower model-predicted warming estimates may still be too high. At the half way point of the feared doubling of the warming potential greenhouse gases in the atmosphere, the model scenarios are over predicting warming by a factor of two or more. The two global temperature measurements from satellites and balloons in their two decades of existence have not picked up the “greenhouse signal” where it should be most pronounced or at least discernible—the lower troposphere. This suggests that surface thermometers may be overestimating warming and/or the surface warming is primarily the result of other factors than just the enhanced greenhouse effect (such as increased solar radiation). A natural warming trend neuters the case for climate alarmism. The reduced growth rate of greenhouse gas buildup in the atmosphere in the last decade, as much as half the rate of some alarmist scenarios, extends the warming timetable to facilitate adaptation under any scenario. The reduced buildup is primarily related to greater carbon dioxide intake—the “greening of planet earth” phenomenon of robust carbon sinks. Reducing criteria air pollutants in urban areas not in compliance with the Clean Air Act. Modernizing and simplifying the tax code to provide more incentives for capital-intensive businesses to modernize their physical capital, thus lowering energy usage and related GHG emissions. Maintaining incentives (or removing disincentives) for hydroelectric and nuclear power generation facilities that produce carbon-free electricity.Increasing energy conversion efficiencies of new electric generation capacity and a growing market share of natural gas-fired power relative to coal are natural market processes that will complement the above public policy reforms. Together, they will ensure that GHG emissions are not greater than their free market levels and will continue to fall per unit of output (the decarbonization phenomenon). Agenda-driven climate alarmism should be rejected by corporate America on pragmatic and social responsibility grounds. Not only does the balance of evidence point toward net social benefits from a carbon dioxide enriched and moderately warmer and wetter world. 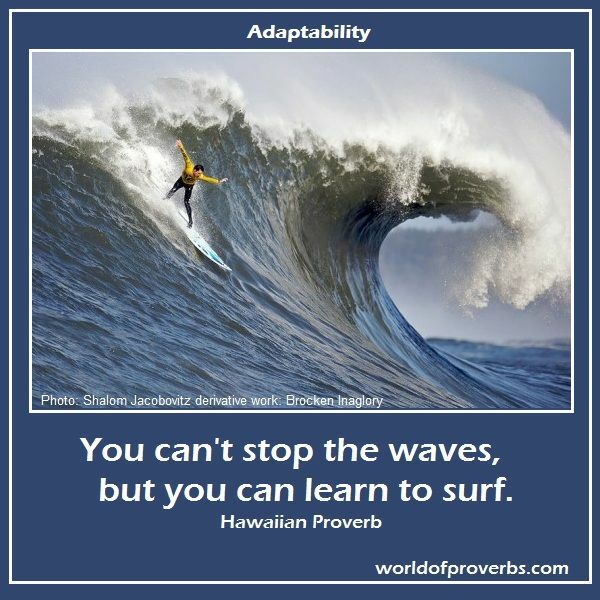 Energy reality concludes that any short-term regulatory approach is futile and wasteful compared to perfecting business-as-usual strategies and using the wealth of energy abundance and free global markets to adapt to any weather and climate conditions in the future. Source: NASA Worldview July 18, 2017. Click on image to enlarge. July is showing again the resilience of Arctic ice this year. The graph below shows 2017 extents for the first 19 days of July compared to the average for the previous 11 years, to 2016, to 2007 and the SII (Sea Ice Index) estimates for 2017. The graph shows 2017 holding to the decadal average and just yesterday dropping below 8M km2, one day ahead of average. Meanwhile the other extents are much lower than 2017: 2016 is down 357k km2, 2007 is 379k km2 down, and SII shows 2017 480k km2 less than MASIE day 200. As we shall see, this year’s extents are in surplus on the Atlantic side, offset by deficits on the Pacific side and in Hudson Bay. The image shows the evolution of Arctic ice from 2007 to this year for day 200. 2007 overall ice extent on day 200 was lower by 380k km2, 2017 showing surpluses everywhere except Kara and CAA (Canadian Arctic Archipelago). Compared to the decadal average, the 2017 larger deficits are in the Pacific ( Chukchi and East Siberian) and in Canada (Hudson Bay and CAA). These are offset by above average extents elsewhere, especially in Laptev, Greenland, Baffin and Central Arctic. Barents is still surplus to average, but has now fallen behind 2014 as the highest in the last decade. The black line is average for the last 11 years. 2007 in purple appears close to an average year. 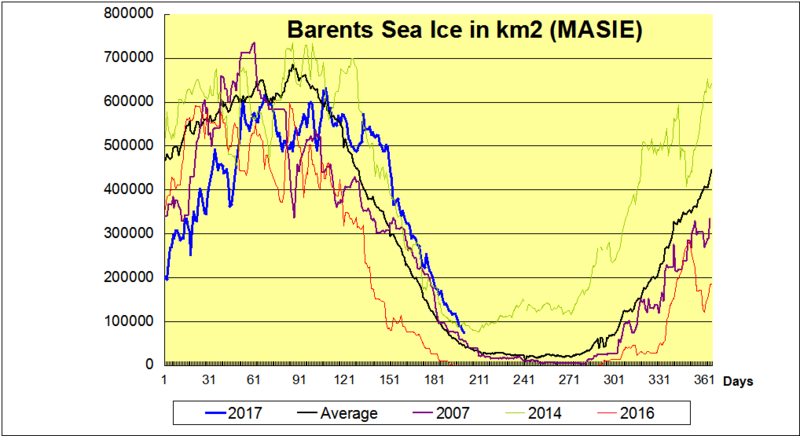 2014 had the highest annual extent in Barents Sea, due to higher and later maximums, holding onto ice during the summer, and recovering quickly. In contrast, 2016 was the lowest annual extent, melting out early and recovering later. 2017 in blue started out way behind, but grew rapidly to reach average, and then persisted longer to exceed even 2014 before falling behind just recently.